Last summer, Brandon brought sunshine on a cloudy day; this time, he brought a smile that eclipsed the sunshine on a sunny day. 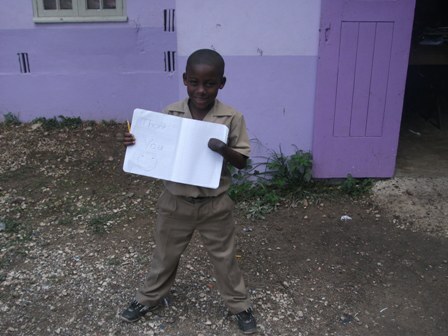 After his class received books and pencils, Brandon expressed his gratitude with an indelible, poignant picture. This was and truly is one of the cases where a picture is worth more than 1000 words. He started coming to school regularly now. Thanks to you. Thanks for the help for the little boy, one day I hope somebody will help him with his hand. Even though Brandon is the only one sponsored on the school’s lunch program, if all the children drew pictures expressing their gratitude, they probably would look similarly to Brandon’s indelible one.